Electronic City is a multi-media theatre piece and a romance like none other. 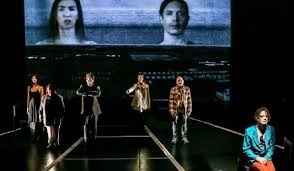 Set in the liminal spaces of modernity, the play follows characters Tom and Joy as they seek belonging, connection, and meaning amid transient lives pressured by long-distance travel, instant communication and constant commerce. With New Stage Theatre Company’s signature flair for beauty, darkness and humor, the show will explore the isolation and alienation of our image-saturated culture using a dynamic mix of interactive projection, choreographed movement, bold design, and Richter’s compelling text.